Canadian Hockey Team, St. Moritz, 1928. Chamonix was a full winter sports programme presented for the first time. 16 countries participated and there were 294 competitors. The Canadians, members of the Granite Club of Toronto, won the first official Winter Olympic Gold Medal for ice hockey. 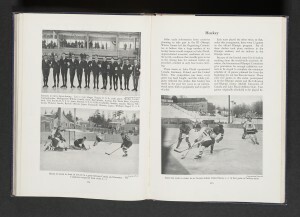 The Canadians repeated the exploit in 1928 at St-Moritz; this time the team was made of members of the University of Toronto Graduates Team. Canadians would repeat the exploit in 1932 at Lake Placid. Noteworthy, the International Olympic Committee approved demonstrations of sled dog race competitions at Lake Placid on the basis that it was a sport peculiar to the country holding the Games. Canada and the USA had teams. Manitoban Emil St Goddard won the first place. McGill University had a hockey team playing a game out of competition. Canadian hockey team in action, Lake Placid, 1932. Official Report, III Olympic Winter Games, Lake Placid, 1932. III Olympic Winter Games Committee, . 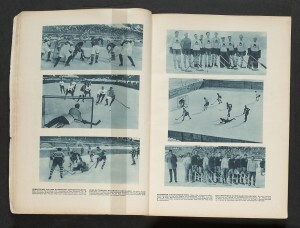 As can be seen from the photograph of the hockey game at Garmisch-Partenkirchen, the events are held outside and are subject to the whims of temperature. Canadians will leave the Gold Medal to the Brits. Frank Shaughnessy Jr. who has dual Canadian-USA citizenship belonged to the USA hockey team and played against his Canadian friend, Kenneth Farmer, whom he had known at McGill in intercollegiate hockey. Canadians won the Silver Medal and Americans the Bronze. 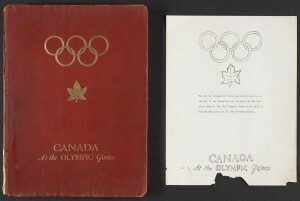 Cover and title page of: Canada at the Olympic Games. 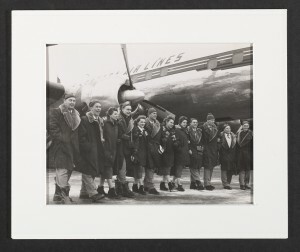 Canadian Olympic Committee, [1939?]. Pre-publication mock-up copy for the 1940 Olympic Games. The Winter Olympics that never happened. In 1940, the Winter Olympic Games were to be held in Sapporo while the Summer Olympic Games site was to be Helsinki. This mock-up copy attests to the fact that preparations had been made, Canadian athletes were getting ready and might have lost the opportunity of a lifetime to participate at the Olympics. In 1948 at St-Moritz, neither Germany nor Japan were permitted to participate. However one may surmise whether they would have been able to provide athletes. The Canadian Hockey Team was composed of members of the Royal Canadian Air Force and won the Gold Medal. A prominent Canadian was Barbara Ann Scott from Ottawa who won the gold in women’s figure skating. Photograph of Canadian Olympic Team Members, Cortina d’Ampezzo, Winter Olympic Games, 1956. Frank J. Shaughnessy Jr., Chef de Mission, is 7th from the right. In 1952, when the Federal Republic of Germany won the Gold Medal for the bobsleigh competitions, there was an uproar. The weighty team of Ostler and Nieberl who won the two-man and four-man event was considered to have used the law of gravity to an unfair advantage. This compelled the International Bobsleigh Federation to introduce weight restrictions for future competitions. Here he is again: Frank Shaughnessy Jr. from 1956 to 1972, Frank is the chef de mission for the Canadian Olympic Association. The Winter Olympic Games were televised for the first time at Cortina d’Ampezzo in 1956. 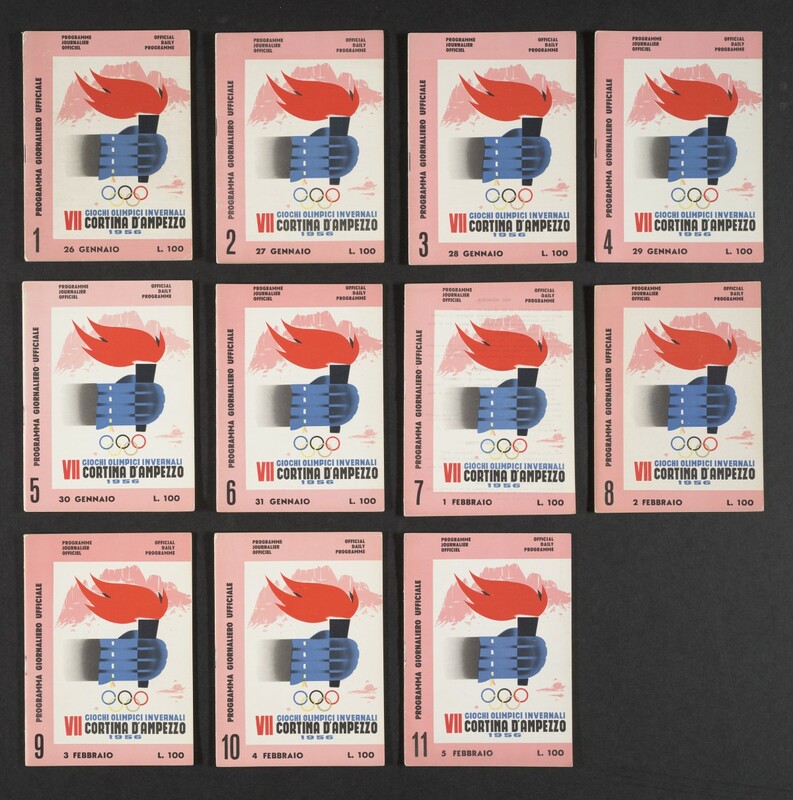 Covers of the 11 daily programs of the Winter Olympic Games at Cortina D’Ampezzo. 1956. 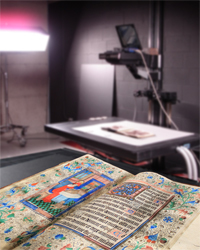 This entry was posted in Rare Books and Special Collections and tagged Digital Exhibition by Sarah Severson. Bookmark the permalink.